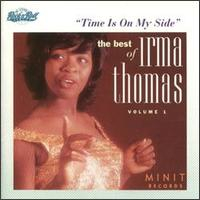 After repeatedly failing to duplicate the success of 1964’s “Wish Someone Would Care,” her sole U.S. hit, Irma Thomas gave up on the big time and settled for local club dates and a day job at Montgomery Ward. I find such obscurity incredible for a singer of her strength and if you listen to the evidence here, I think you’ll agree. Thomas’s dynamic version of Jackie DeShannon’s “Breakaway” radiates personality and a seven-minute remake of the aforementioned 60s hit deserves to chart even higher than the original. If those tracks don’t win you over, try “Ruler of My Heart,” which offers one of the sultriest environments this side of the equator.